Ronpak stays committed to keeping a cleaner Earth. 28 Nov Ronpak stays committed to keeping a cleaner Earth. was the day Whole Foods Market announced its directive to end its widespread use of “one-use” plastic shopping bags in each Whole Foods Market location in the United States, Canada and the UK. So, over an aggressive three-month timetable, Whole Foods quickly phased out the use of plastic shopping bags in order to comply with its stated mission of reducing its environmental footprint in keeping with its corporate responsibility. By the time Earth Day rolled around in April of 2008, their goal had been met. Celebrating the achievement, Whole Foods christened January 22 as “Bring Your Own Bag Day”, alongside their policy of rewarding customers with a small discount at checkout for bringing their own shopping bags (depending upon location). Whole Foods has been lauded for taking a leading position in US supermarkets that understand their new role in environmental responsibility and the appropriate stewardship of the planet. 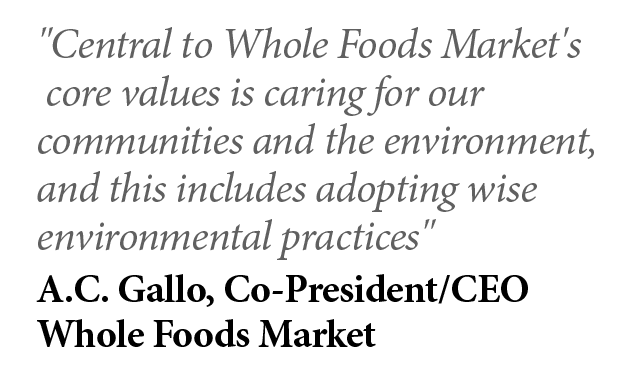 “Central to Whole Foods Market’s core values is caring for our communities and the environment, and this includes adopting wise environmental practices,” said A.C. Gallo, Co-President/CEO Whole Foods Market. The first state in the US to outlaw and ban plastic bags was California. Proposition 67 is the California proposition that favored the prohibition of grocery and other stores from providing customers a 'single–use' plastic or paper carryout bag, but permitted the sale of recycled paper shopping bags and reusable bags for a fee. 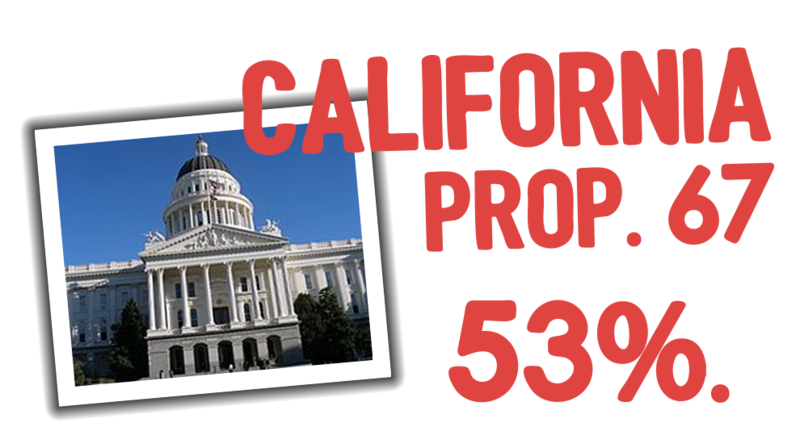 Proposition 67 passed, with 53% of the vote. Widespread adoption of single-use plastic bags has impacted eco-conscious business. Thankfully however, the tide is turning as business interests and consumer concerns are pushing back against the worldwide proliferation of disposable plastics use. Growing awareness and concern with respect to carbon footprint has pushed communities, governments and the businesses operating alongside to refocus their efforts to improve and build upon sustainability processes. In the commercial paper products space, Ronpak is leading the way to curb its’ environmental impact. • Paper and Paperboard waste generation was around 68.05%, with 45% of that being recycled. The amount of paperboard that ended up being landfilled post-recycling was 18.28%. • In contrast, plastics waste weighed in at around 34.50%, with its’ landfilled weight reaching 26.01%. What about the so-called "biodegradable plastics or bioplastics"? Be aware that plastics that are marketed as “bio-green, bio-degradable or naturally degradable” still carry polyethylene plastic components (made from petroleum by-products) and when they get “broken down”, the end result is simply much smaller micro-fragments of polyethylene plastic. These items can’t be truly a naturally degrading product, because they cannot be fully dissolved in nature. Plastics products that are truly compostable and fully dissolvable by natural processes must meet strict criteria such as the Australian Standard AS4736 (for example) in order to be labeled ‘biodegradable’. More info regarding biodegradability of bioplastics and the AS4736 Standard here. Ronpak's commitment to sustainability remains as strong as ever. As a paper-products marketing and commercial packaging company, Ronpak has always been committed to the protecting of our environment by advocating and supporting commercial paper products as a more eco-friendly and ultimately more sustainable, renewable resource as compared to oil-based, single-use plastic bags. Throughout its seventy-plus year history, Ronpak’s corporate recycling initiatives have continued to pave the way for companies to adopt and utilize manufactured materials recycling while choosing to use responsibly-sourced raw manufacturing materials to conserve energy whenever possible in its paper bag manufacturing processes. 20% Reduction of commercial water usage. With respect to environmental sustainability interests, Ronpak has set an aggressive goal: the establishment of an ongoing Environmental Management Process, targeting all water usage across all its manufacturing facilities for a 20% use reduction by the year 2020. In addition to its adherence to the California Transparency in Supply Chains Act, Ronpak continually strives for the best environmental stewardship as a multi-purpose paper products manufacturer. Ronpak's sustainability doesn't stop there. Ronpak is moving forward with plans to implement the ISO14001 Environmental Management System in all facilities. Ronpak is currently managing the development of a carbon footprint to determine the number of greenhouse gases (specifically carbon dioxide) that are emitted by all facilities. Ronpak will initiate compostability marks of conformity to provide compost facility operators a guarantee that Ronpak’s certified products will biologically degrade in accordance with the specified criteria, without negatively impacting the compost that’s ultimately produced. Ronpak has implemented the How2Recycle labeling system to promote consumer responsibility that clearly communicates recycling instructions to the public. How2Recycle involves a coalition of forward thinking brands who want their packaging to be recycled and are moving to empower consumers through smart packaging labeling. Part of Ronpak’s Sustainability initiatives include its Waste Stream Reduction, Energy Consumption, Corrugated Packaging Reduction and Inks (VOC’s). 95% of Ronpak’s waste is recycled, with goals in place to reach a minimum maintenance of 95%. Ronpak recycles up to 95% of its press waste. 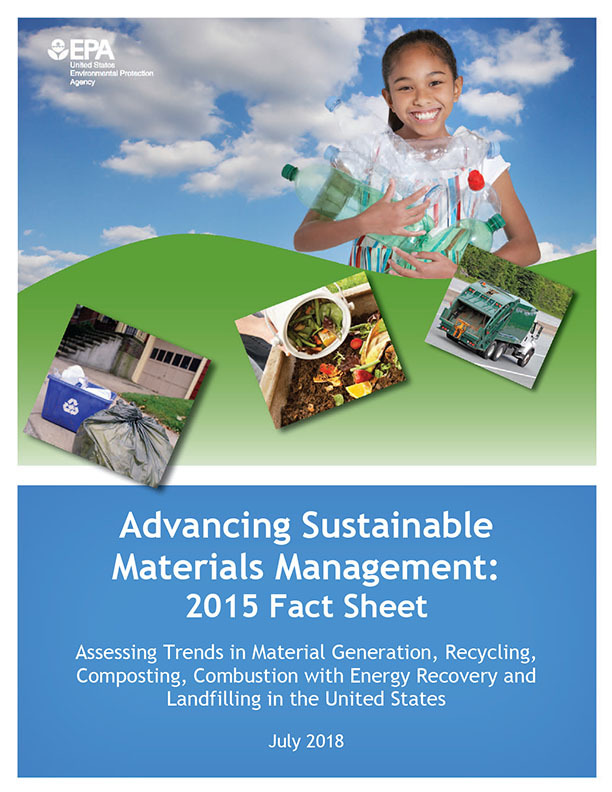 Paper, plastics & aluminum (office) waste is recycled as well, adhering to a maintenance goal of 93% recycled waste. With deep investments such as motion-sensitive lights, HVAC management systems & improved insulation, Ronpak has stayed the course to conserve its energy use in 2016. Ronpak’s New Jersey facility even features solar panels which generates additional clean electricity for the local electric grid. Ronpak’s use of certain automatic packaging machines provides the ability to replicate a heavier weight corrugated product via lighter weight material. As less heavy corrugated is used, less waste is produced. Ronpak’s printing goal is the complete elimination of VOC’s/heavy metals in all printing inks. In this way, Ronpak’s sustainability goals become part of its own culture as demonstrable proof of working towards continual reduction of its commercial carbon footprint.